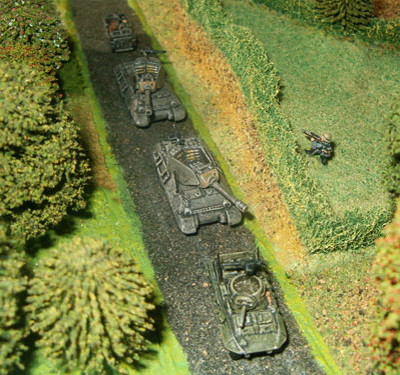 The basic 3 part M10 model (hull, Turret & .5" AAMG) as it arrives out of the pack, from Pendraken Miniatures. The first stage is to prepare the model for undercoating. This invloves cleaning up any flashing and mould lines using needle files and a scalpel (as with tools please be careful when using them). The barrel of the gun should be drilled out to about 1mm depth with a pin-vice, using a drill bit slightly smaller than the barrel's	diameter. Once it's cleaned up the mount for the AAMG is	drilled out and the AAMG stuck on using super glue or 2-part epoxy resin. Once the model is cleaned, extra detail can be added to it. This includes baggage, netting, sandbags, aerials, crew, petrol cans,	packs - the list	can	go on and on. This detailing adds individuality to your models and is well worth the extra effort. If you're not sure what extras crews used to add to their vehicles during WW2,	just check out photos of	the actual vehicles you'll find plenty of inspiration within them. The images above give some ideas of what you can achieve using milliput and green-stuff to add detail to the model. As I wanted this model as a British	M10	I've added a muzzle break to represent the 17pdr gun (righthand pic above). Next the model needs to be undercoated to give a good base for the paint to adhere to. I always use a white undercoat as I find this helps give a more illuminous base for the colours to be used on-top later. 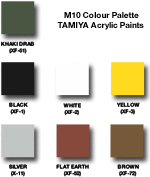 Other base coat colours that can be used are grey and black, although I feel these produce a duller looking paint job in the	end. I use a basic white acrylic car primer for undercoating	my models. It's important to	spray in a well	ventilated area using 2-3 light coats – not one	heavy	coat that'll obliterate the detail on the	model. Allow plenty of drying time at this point before moving on to the next stage. Now it's time to start adding colour, the patience taken on the previous stages will be well rewarded now at the painting stage. You should pick a colour that is sympathetic to the actual vehicles themselves. As this project is for a M10 in British service in 1944 North Europe, I'll use a base colour of Khaki Drab. Firstly paint the Khaki Drab all over the model, then let this dry. Next comes a wash of black over the whole model. I use black ink for the wash as this gives a denser colour than thinning an acrylic black paint. Let the black wash dry thoroughly. Next step is to apply progressively lighter tints of the base Khaki Drab colour. The technique used is dry-brushing, firstly I dry-brush using yellow added to the base colour. The next dry-brush coat I add white to the base colour. I then add more white and continue dry-brushing until I'm happy with the look of the model. Once the base coat and dry-brushing is completed it's time to paint the other items on the model. I use black next to pick out the tracks, aerials and MGs. Again use a dry-brush technique to pick out the detail in the areas black has been applied to, but use a silver to lighten the black. With the tracks a thin wash of reddy-brown can be applied to suggest rusty metal. Next step is to pick out other items like baggage, shells, etc in a suitable colour. Once all painting is complete I add any markings and tactical signs, I usually paint these on but there are transfers available commercially. Lastly, once everything is dry, I give the model a coat of varnish (I use artists picture varnish) to protect it from wear and tear. Apply two light coats of varnish, firstly a gloss and then lastly a matt coat. I use the gloss as I have found this gives more protection than a matt varnish. The matt varnish then gives a more natural look to the model. The varnish also adds depth and enhances the paintwork on the model.